Many employees don’t contribute enough to their 401(k) to take full advantage of their employer’s matching contribution. Are you one of them? Maybe you feel you have too many bills to pay and retirement is a long way off. But there are few deals better than free money. Moreover, the amount you contribute is on a pre-tax basis, lowering your tax liability, so you’re not actually “losing” the full amount from take-home pay. As an example, let’s say “Mike” earns $50,000 a year and falls within the 25% tax bracket. If Mike contributes 10% of his income, or $192.00 on a bi-weekly basis, his take-home pay is reduced by an estimated $133.00. For the entire year, Mike’s contributions of $4,992.00 only cost him $3,458.00. Online calculators can help you estimate how your pre-tax contribution will affect your take-home pay. If Mike’s employer offers a matching contribution, things get even better. Employers may contribute a dollar-for-dollar match on contributions up to a certain percentage of salary, and some might offer a 50% match on contributions up to a certain percentage of salary. If Mike’s employer offers a dollar-for-dollar match of up to 6% of Mike’s salary, that totals an additional $3,000 added to Mike’s retirement account yearly. This effectively doubles his investment. Mike could, of course, increase his contribution to the maximum allowed annually by the IRS (in 2018, $18,500 or $24,500 if Mike is age 50 or older). His employer contribution wouldn’t change for that year, as the maximum is 6% of his salary, but the employer’s contribution does not count toward the annual limit. If Mike receives annual raises and continues to contribute 10% of his salary, his employer’s match increases each year as well. Over the long term, this “free money” contributed by his employer can add up to tens of thousands of dollars. These additional funds and the magic of compound interest will make a significant impact on Mike’s retirement nest egg. The key is consistent employee contributions over time. And when contributions are automatically withdrawn and you don’t even see the money, it’s a lot easier to do. 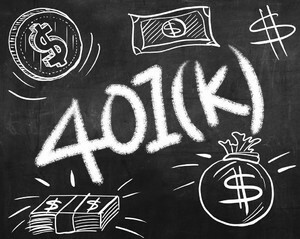 Watching your 401(k) balance grow over the years is an incentive to stay on track with your contributions. After all, each year that passes is a year closer to retirement, and those savings are your path to financial freedom. So don’t leave free money sitting on the table…start now to take advantage of employer matching contributions. Your future self will thank you!